The matches for the preliminary round of Group D of the UEFA Futsal Euro 2015/16 are in full swing (until Sunday, January 18) at Futsal Arena in Chisinau, Moldova, on brand new sports parquet by Dalla Riva Sportfloors. 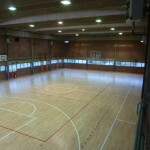 In addition to the Moldovan national team, on the sports parquet prepared by the company of Montebelluna, are challenging San Marino, France and Albania. Who, among the 24 representatives divided into six groups, will win their group, will arrive at the main round along with 22 other nations already qualified in law. The 28 remaining teams will form another 7 rounds the winners of which, in addition to Serbia, the organizing team, will play the finals scheduled from 2 to 13 February 2016. The 7 best runners, plus the best third, will participate in the playoffs of 15 and 22 September 2015. The winners of the four playoffs will complete the board of the tournament. 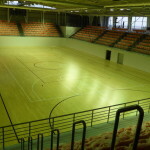 For the company Dalla Riva Sportfloors is a source of great satisfaction and pride to have contributed to making better this European Futsal event with the installation of a sports parquet floor with high performance.